Give your lawn’s working gnomes an update with our growing selection of funky favorites at GardenFun! 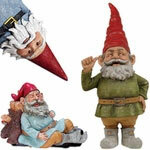 Add a working gnome statue to your collection or purchase one of these backyard figures for a special occasion gift. 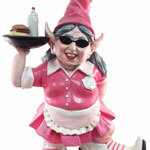 Our customers love our Kiss the Cook gnome. This 21-inch statue is a great addition to any cooking space, including outdoor barbeque setups or even your kitchen. Each Kiss the Cook gnome comes with a gnome-style chef’s hat, fork and spoon and an apron that comes with a big red kiss on the front. Every chef or barbeque master in your home will love having this little culinary expert in their corner. 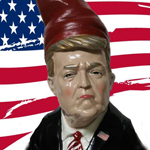 Our Commander in Chief gnome is the perfect way to play homage to America’s president. 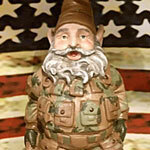 Each Commander in Chief gnome portrays the president in the middle of a passionate speech. He is wearing a full suit with gnome pointed shoes and an American flag on his lapel. This 15-inch statue is an awesome gift for Obama fans and a funny gag gift for those on the other side of the aisle. 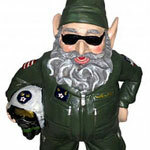 For the fireman or policeman in your family, we have the gnomes they need. Our adorable 13-inch police gnome is an appropriate size for either your garden or your desk at the station. This protective law enforcement gnome comes with a pistol and handcuffs to help you fight crime. 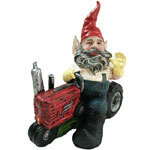 Our fireman gnome is a GardenFun treasure, equipped with its hose and axe for its next firefighting mission. 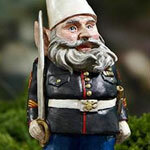 Add a police or firefighting gnome to your yard or desk for extra protection and a little luck. Our other working gnomes include the speed racer, Mexican dancer, mariachi and showgirl figures. Choose the weather-resistant cast stone resin GardenFun working gnome that complements your collection, completes your decor and fits in your indoor or outdoor space.